Located on beautiful Lake Mindemoya, this camp is the relaxation centre of Manitoulin Island. All of our cabins look outwards to our clean, sandy bay where kids and adults can have a great time swimming, and at the end of each day, look out of their windows at one of the most spectacular sunsets that they will ever see. We are a quiet, family oriented resort located about 1.5km north of the village of Mindemoya on the beautiful Ketchankookem Trail – popular for walking and bicycling. Groceries, shopping, laundry mat, restaurants, fuel and hospital are all only a 5 minute drive away. 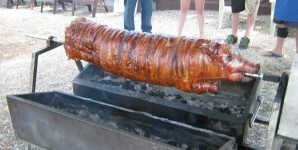 Sunday July 1st we all celebrated Canada Day with our Annual Pig Roast. What a great time was had by all.